Lobate Lac Scale has been found mostly on woody dicotyledonous plants. It infests the woody portions of twigs and small branches and less frequently main stems of usually < 2 cm in diameter, but usually not branches or main stems of > 2 cm in diameter. It has not been observed on foliage. 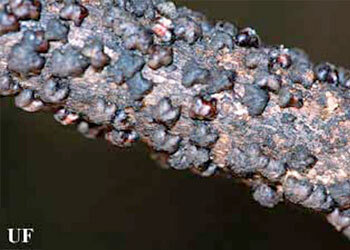 On highly susceptible hosts, the scale insects are crowded, forming a contiguous mass that appears as a dark, lumpy crust.